Throughout America, cities are on the rebound, thriving as they have not in generations. While successful cities have had their own special formulas for revival, they appear to have in common a clear set of principles that lead to urban health. This blueprint forms the foundation for Myron Magnet’s penetrating collection of articles drawn from the pages of City Journal, the quarterly magazine that has established a reputation for pathbreaking analytical reports on the urban scene. The Millennial City‘s premise is a rejection of the municipal welfare ideology that led to decades of failed social and economic policies. Instead it explores new approaches to crime and its prevention; the reform of welfare to end the notion of “entitlement”; the reinvention of government to make it smaller and more effective; and new school initiatives that emphasize performance. Within these broad categories the book also takes on issues of the economy, housing, homelessness, immigrants, quality of life, and the physical environment. As Mr. 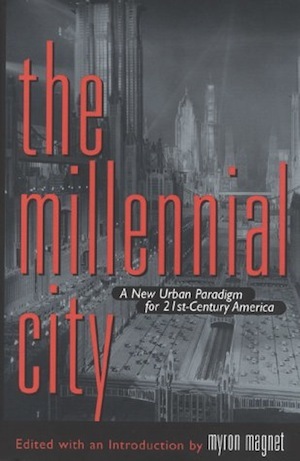 Magnet points out in his introduction, more and more Americans are coming to understand that cities are not ungovernable. The Millennial City offers a good many reasons why. This entry was posted in Edited Collections. Bookmark the permalink.